McLarens dominated the early years with their Kiwi Orange bodies, the M1B, M6A, and M8A. Bruce McLaren and Denny Hulme were frequently the men to beat. But by 1970 other teams were starting to challenge McLaren, the likes of Lola, Chaparral and Shadow. 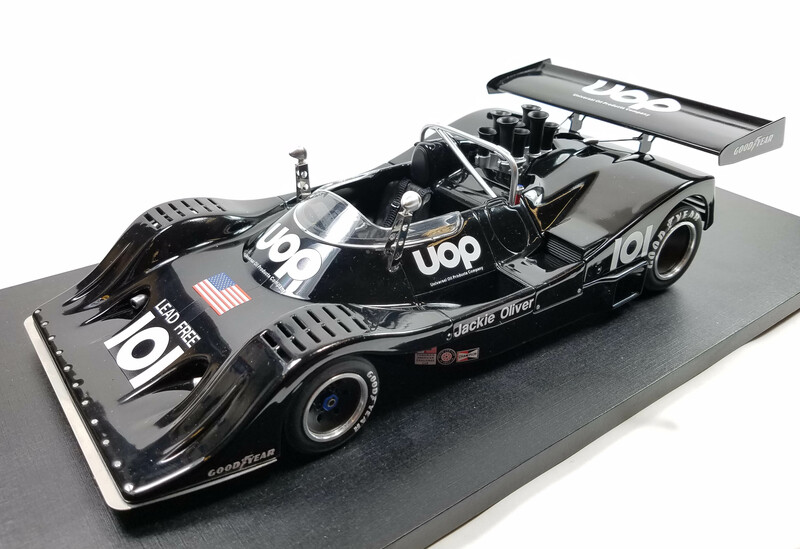 By 1974 Shadow would win the Can-Am title, and Replicarz has developed its own 1/18 version of that sleek black racer, driven to the championship by Jackie Oliver and to second place by teammate George Follmer. Shadow started its runup to the title in 1970 with its Mk.1 that emphasized aerodynamics while touting the same 700+ horsepower big block Chevy V8 that many Can-Am teams ran. Don Nichols, known for his eccentricities, such as wearing all black clothing and dark glasses, was the team owner. Not surprisingly he bathed all his cars in black, perfect for the Shadow team’s image that Nichols and his company, Advanced Vehicle Systems (AVS), wanted to project. 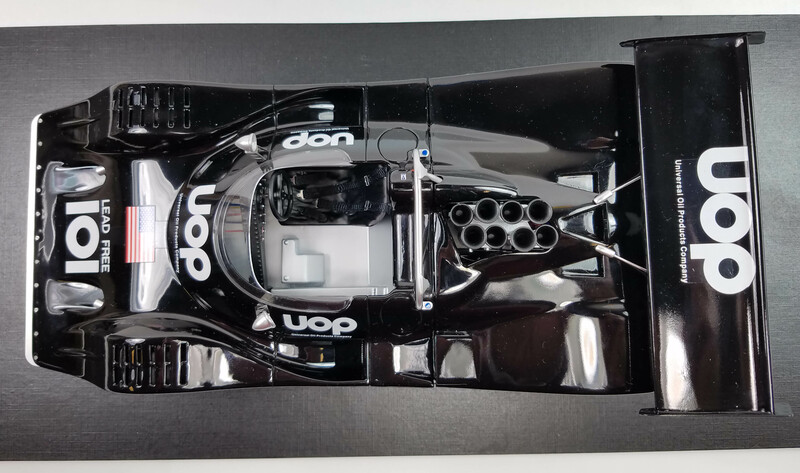 The DN4 that won the title was new for the season, both smaller and lighter than previous Shadows. It was designed by Tony Southgate and was clearly the class of the field. The Shadow ran an all-aluminum Chevy 495 cid V8 rated at 735 horsepower, but Can-Am experts say that was low, it probably made as much as 800 horses. The Shadow ran 13-inch front tires and larger rear slicks, making the car nimble, and powerful, allowing Oliver to win four of the five races in a season that was cut short by financial woes and the gasoline crisis. It proved to be Can-Am’s final season. This Shadow is a black beauty to be sure and big. Can-Am cars were not petite. This model measures 10 ½- by 4 5/8- inches with its giant rear wing that hangs off the back. With its rear bonnet in place this is a sleek handsome racer with few markings to spoil its shape, just giant white UOP logos. That stands for Universal Oil Products Company. Otherwise, the racer sports a No. 101 on the nose and sides, a Goodyear sticker on the wing’s end plates and fenders ahead of the front wheels, and Oliver’s name on the sides along with “Lead Free” over the nose’s 101 marking. All logos are white. Just below the front fenders and behind the front wheels, slightly hidden from sight from some angles are three logos, including the Can-Am racing sticker. The sleek body features perfect dimensions to the original 1/1 car and includes the open vents above the front wheels, a silver aluminum-look chin spoiler with small rivets holding it in place, and a tall reinforced brushed metal-look roll bar behind the cockpit. I also like the drilled-out metal posts that hold the car’s two tall side mirrors to help the driver see over the Shadow’s massive wing. 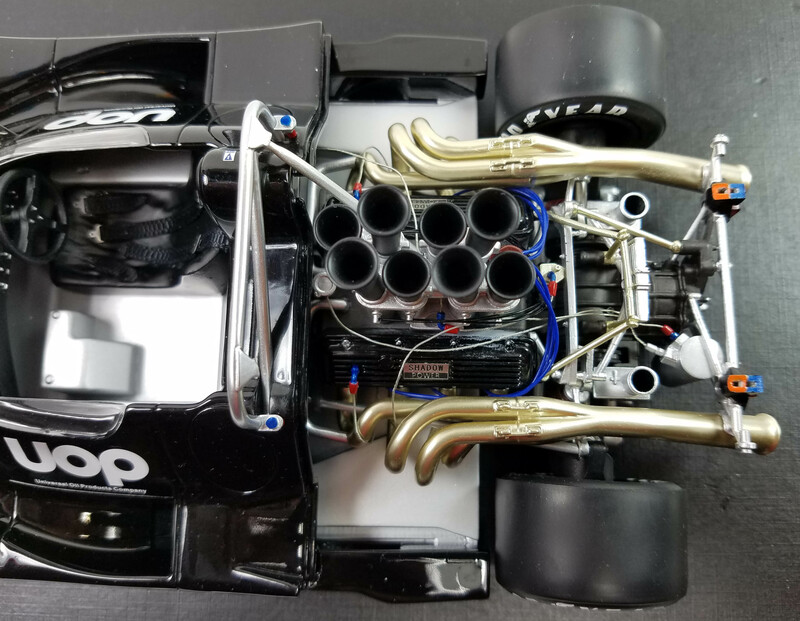 Everyone who saw the car in my office commented on the flat black engine stacks that vary in length, a distinguishing feature of the racer. 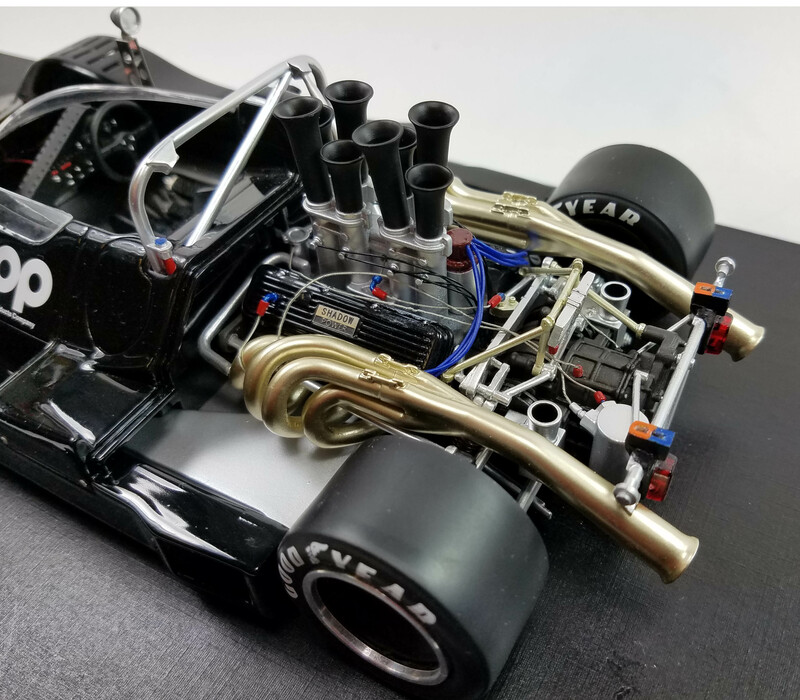 Under that removeable rear bodywork is a sharply detailed Chevy V8 with wiring and plumbing and twin giant exhaust pipes that wind their way out the back with huge trumpet-like exit pipes. 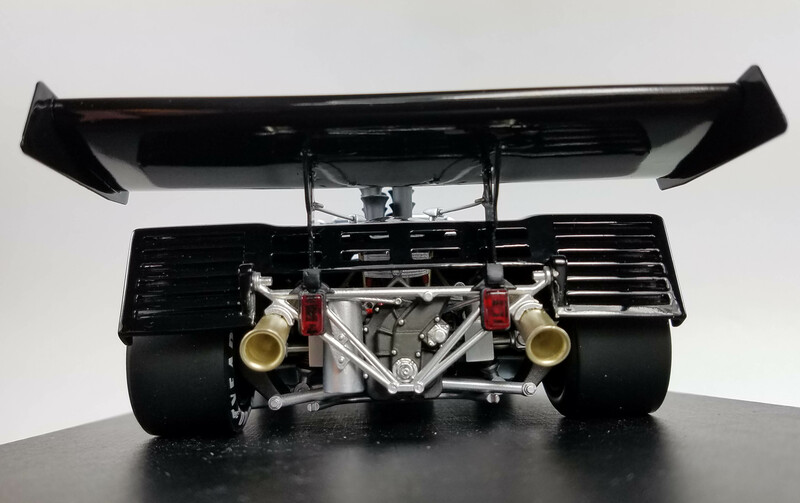 The rear wing mounts to the chassis in back, just above two red taillights and two metal struts extend off the wing’s supports to fit into holes in the body behind those stacks. Wheels are flat black with silver rims and red locking nuts on the right and blue on the left. The slicks are labeled Goodyear on the sidewalls. Shadow’s cockpit is sparse, looking like an aluminum tub with black seat and shoulder and lap belts complete with metal clasps. The dash is a distorted V-shape with buttons and a few gauges, plus wiring extending out beneath the clear windscreen. Shadow’s steering wheel is 3-spokes and black. Replicarz will release the Follmer car, product No. R18803, at the same time as Oliver’s in March. Follmer’s car was identical, but it wore No. 1.